I have been making cards now on and off for about 2 years now and I never get tired of making them. I love this web site because it has taught me a lot about the art of making cards. I usually make cards only for the people in my family and my church family for birthdays and anniversaries. However I was recently asked to make one for a lady in our church to give to her friend. I will show it at another time. 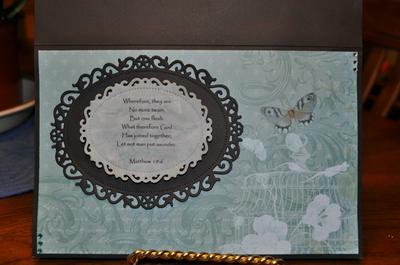 The card you are about to see was made for my Pastor and his wonderful wife for their wedding vow renewal ceremony. They loved it and have it displayed in their home. I was so proud that they really liked it so well. I started this card with a piece of 12x12 black cardstock. I cut it down to 8 1/2"x 11". I scored it at 5 1/2" and made a A9 card. This was the base for the card. Then I took sheets from the Mariposa paper pack by DCWV and matted the card leaving a small border around it so the black would show. I used the same paper for the card box. I used the medium size EK Success Retro Flower punch to punch out the flowers. Then I put a color matching rhinestone in the middle of the flower for the center. 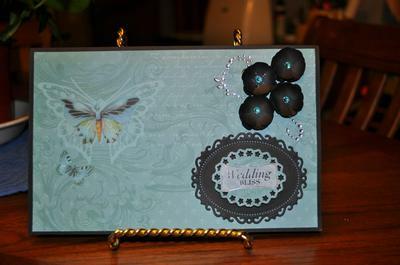 I used the Spellbinders Nestabilities Floral Ovals die for the front and inside sentiments. The front is a Paper Studios wedding sticker. There is also one on the front of the card box. The sentiment inside is computer printed on vellum paper then cut out with the Floral Oval dies. 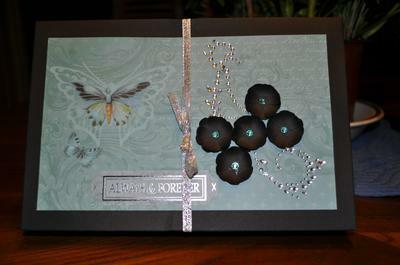 I placed some rhinestone bling on the card front and the card box which I got from Wild Orchid Crafts. It took about 2 hours to make this card because I, like most ladies who do crafts, have a million other things to do. LOL However I really enjoyed making it for them. I hope that others enjoy reading about it. this card is lovely and one I am sure that you are very proud of. I am also sure that the recipient loved it. There seem to be a million and one things to learn when you first start making cards but as your confidence grows things become a little easier. Thank you for the nice comment. I really enjoyed making this card. this is a very nice card!